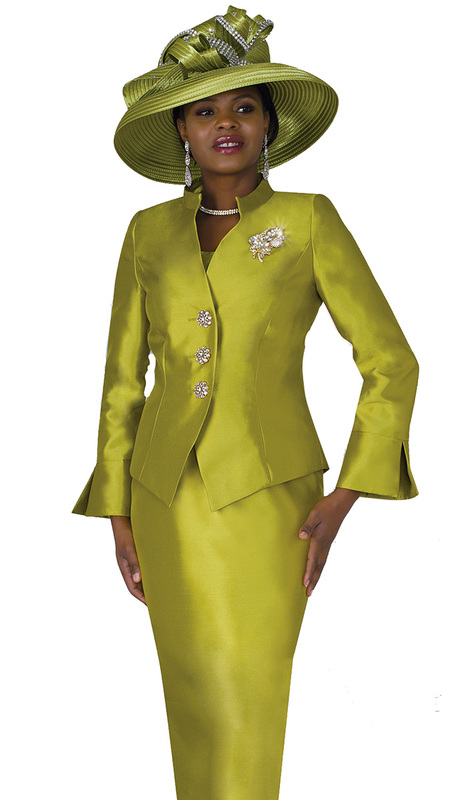 Create a polished finish to all of your Lily and Taylor Church ensembles with matching hats. All hats shown can be ordered from LILY AND TAYLOR HATS. 3 Piece crinkle skirt suit. 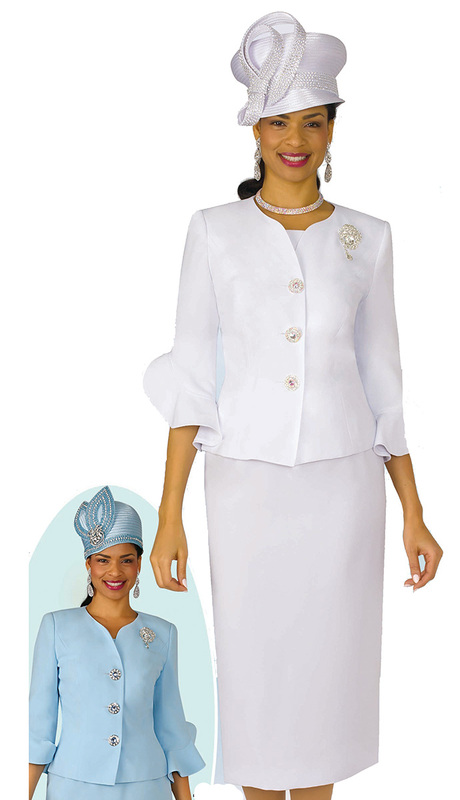 Matching Ivory HAT/H263 can be ordered in Lily and Taylor Hats. 3 piece french crepe pantsuit. Straight pants and cami. 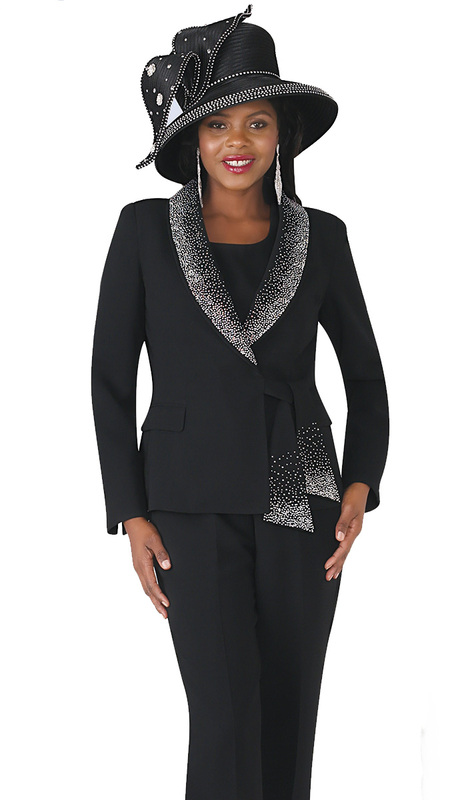 Shawl collared jacket with sash closure and micro-jewel trim. Matching BLACK HAT/648 can be ordered in Lily and Taylor Hats. 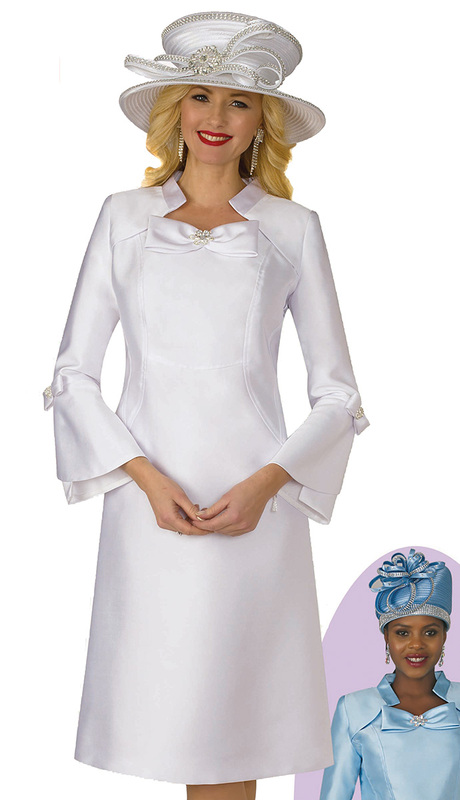 1 piece silky twill dress with bow trim at neckline and flared sleeves. Matching WHITE HAT/266 and ICE BLUE HAT/351 can be ordered in Lily and Taylor Hats. 3 piece chevron pattern silky suit. Straight skirt and cami. Collarless jacket with jeweled clasp and brooch. Matching PINK HAT/677 and WHITE HAT/590 can be ordered in Lily and Taylor Hats. 2 piece ponte knit pantsuit. 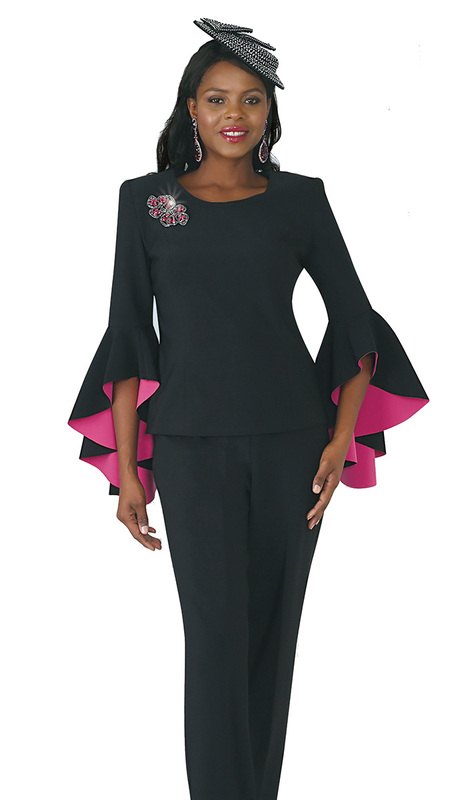 Top has dramatic ruffle flared sleeves with contrast lining. Jeweled brooch included. Matching BLACK HAT/577 can be ordered in Lily and Taylor Hats. 3 piece metallic abstract print suit. Straight skirt and cami. Collarless jacket with jeweled clasp. Matching SILVER HAT/645 can be ordered in Lily and Taylor Hats. 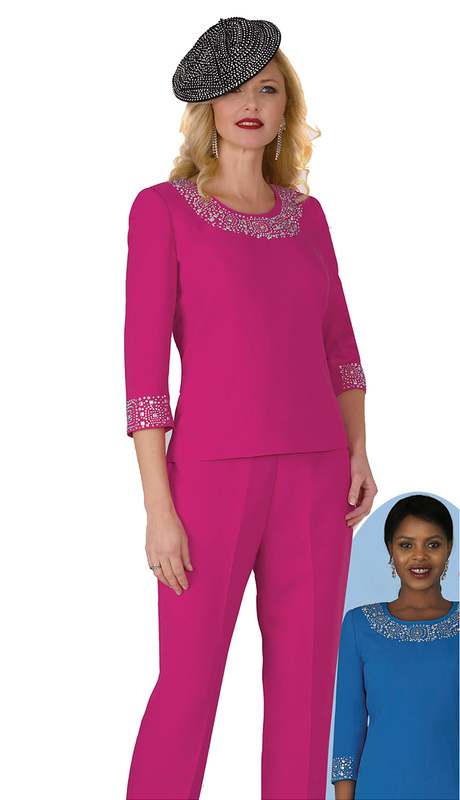 2 piece french crepe pantsuit with micro-jeweled trim at neckline and cuffs. Matching BLACK HAT/577 can be ordered in Lily and Taylor Hats. PRE-ORDER WILL SHIP 4/25. One piece ponte knit dress with accordian ruffle neckline and cuffs. Matching WHITE HAT/570 can be ordered in Lily and Taylor Hats. 3 piece french crepe pantsuit. Straight pants and cami. Jacket with notched lapels, open flared sleeves and gold trim. Matching GOLD HAT/579 can be ordered in Lily and Taylor Hats. 2 piece silky twill, floral print suit. Straight skirt and jacket with flared sleeves, jeweled buttons and brooch. Matching WHITE HAT/672 and ORANGE HAT/414 can be ordered in Lily and Taylor Hats. 1 piece dress with floral trim on bodice. Flared, slit sleeves and jeweled brooch. Matching BLUE HAT/628 can be ordered in Lily and Taylor Hats. 3 piece silky twill suit. Cami and full pleated skirt in floral brocade pattern. Single lapel, solid color jacket with jeweled brooch. Matching ROYAL HAT/121 can be ordered in Lily and Taylor Hats. 1 piece dress with jacquard trim, jeweled button trim on asymmetrical sleeves, and jeweled brooch. Matching PINK HAT/627 can be ordered in Lily and Taylor Hats. 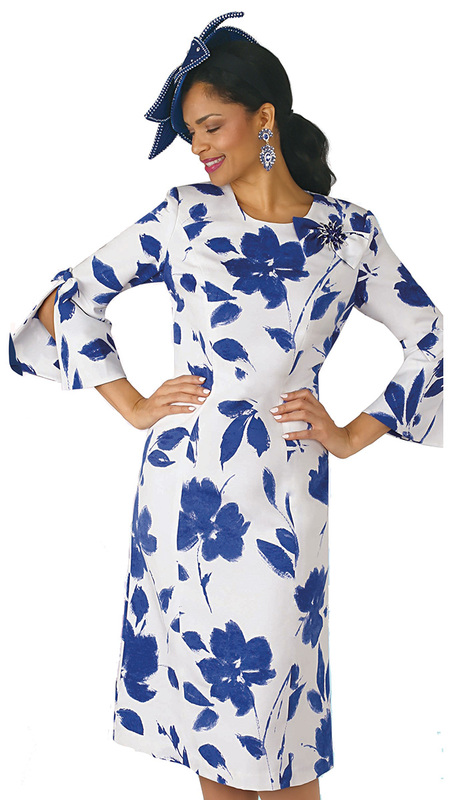 1 piece dress with floral embroidery pattern, bow-tie trim and flared sleeves. Matching GOLD HAT/576 and BLUE HAT/627 can be ordered in Lily and Taylor Hats. 1 piece french crepe dress with ruffled hem and flared sleeves. Jeweled brooch included. Matching ORANGE HAT/669 can be ordered in Lily and Taylor Hats. 2 piece silky twill suit. Straight floral embroidery skirt. Collarless jacket with ruffle pleated hem, bow-tie trim on slit sleeves. Three jeweled buttons and brooch. Matching NAVY HAT/572 can be ordered in Lily and Taylor Hats. 3 piece ponte knit suit. Straight skirt and cami. Jacket in floral print with ruffled, asymmetrical hem and jeweled clasp and brooch. Matching NAVY HAT/256 and NAVY HAT/670 can be ordered in Lily and Taylor Hats. 3 piece silky twill suit with floral brocade pattern. 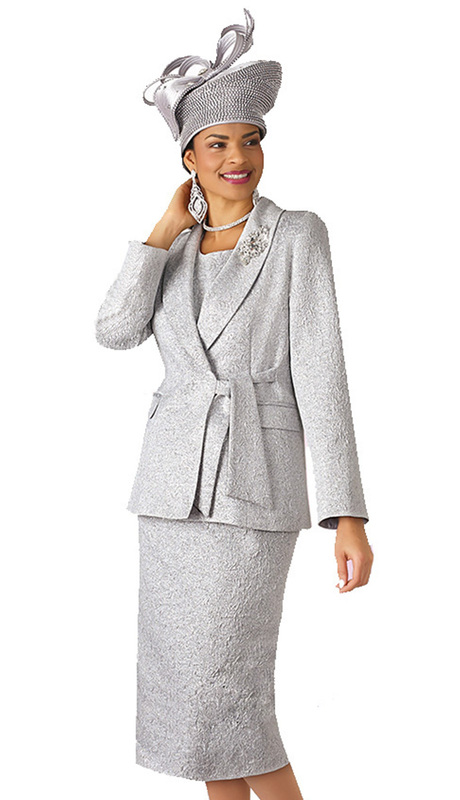 Straight skirt, peaked lapel jacket with one jeweled button. Matching GOLD HAT/646 can be ordered in Lily and Taylor Hats. 1 piece ponte knit dress with full length micro-jewel trim. Matching MAUVE HAT/505 can be ordered in Lily and Taylor Hats. 2 piece french crepe suit. Straight skirt. Top with slit flared sleeves and lace contrast trim. Matching BLACK HAT/589 can be ordered in Lily and Taylor Hats. 1 piece french crepe dress with contrast trim and jeweled brooch. Matching WHITE HAT/263 and PINK HAT/123 can be ordered in Lily and Taylor Hats. 3 piece silky twill suit. Straight skirt and cami. 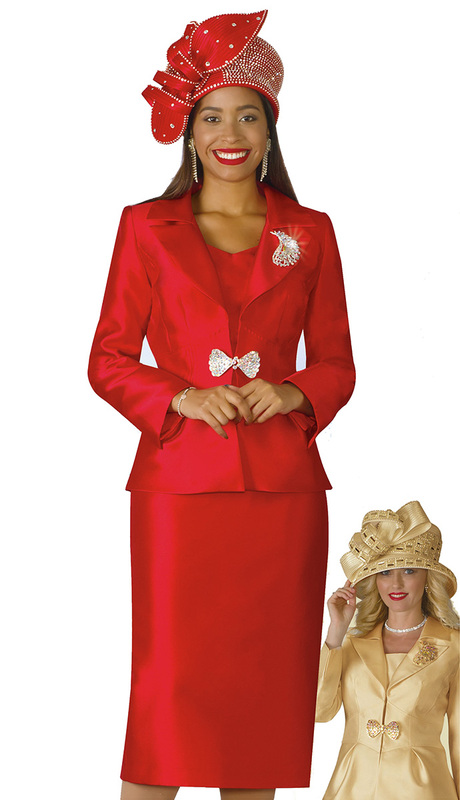 Peaked collar jacket with peaked hem, jeweled button trim on sleeves, jeweled button and brooch. Matching ICE BLUE HAT/244 can be ordered in Lily and Taylor Hats. 2 piece silky twill, floral embroidery suit. 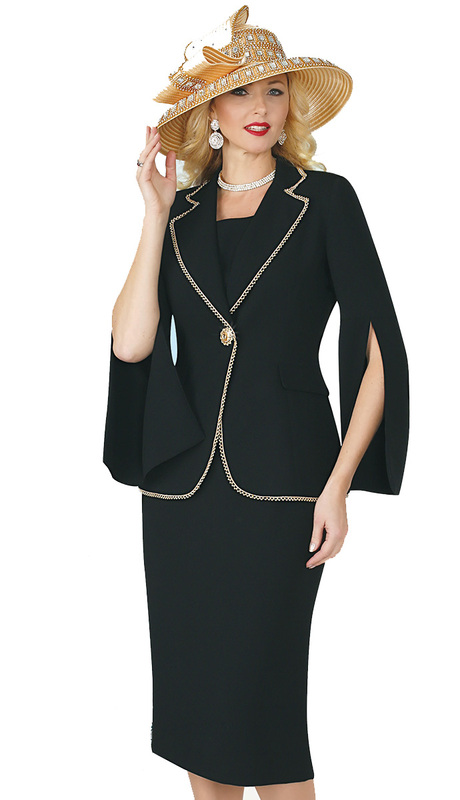 Straight skirt with notched lapel jacket and three jeweled buttons. Matching GOLD HAT/645 and SILVER HAT/261 can be ordered in Lily and Taylor Hats. 2 piece silky twill, floral embroidery suit. Straight skirt with notched lapel jacket and three jeweled buttons. Matching LAVENDER HAT/626 can be ordered in Lily and Taylor Hats. 1 piece french crepe dress with bow trimmed collar and jeweled trim. Matching ICE BLUE HAT/243 can be ordered in Lily and Taylor Hats. 3 piece french crepe suit. Straight skirt and cami. 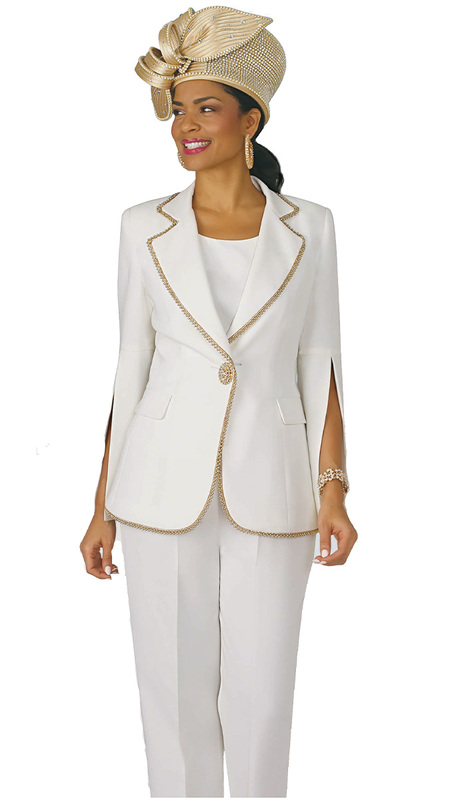 Notched lapel jacket with front slit sleeves and gold trim. Matching BLACK OR GOLD HAT/567 can be ordered in Lily and Taylor Hats. 3 piece metallic abstract print suit. Straight skirt and cami. Collarless jacket with jeweled clasp and brooch. Matching GOLD HAT/594 can be ordered in Lily and Taylor Hats. 3 piece silky twill, striped suit. Straight skirt and cami. Collarless jacket with jeweled clasp and brooch. Matching GOLD HAT/579 can be ordered in Lily and Taylor Hats. 3 piece geometric brocade suit. Straight skirt and cami. 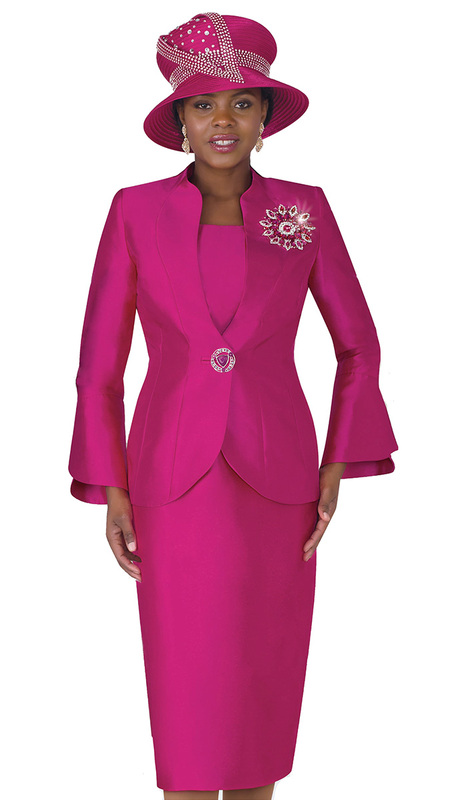 Standing collar, flared sleeves, jeweled button and brooch. Matching ICE BLUE HAT/592 and GOLD HAT/594 can be ordered in Lily and Taylor Hats. 3 piece floral print suit. Straight skirt and cami. Notched collar jacket with jeweled button. Matching FUCHSIA HAT/629 can be ordered in Lily and Taylor Hats. 3 piece woven pattern suit. Straight skirt and cami. Wrap jacket with shawl collar and tie sash. Jeweled brooch included. Matching PINK HAT/550 and SILVER HAT/644 can be ordered in Lily and Taylor Hats. 3 piece geometric pattern suit. Straight skirt and cami. Collarless jacket with jeweled clasp and brooch. Matching SKY BLUE HAT/243, PINK HAT/568, MINT HAT/649 can be ordered in Lily and Taylor Hats. 3 piece french crepe suit. Straight skirt. Wrap jacket with micro-jeweled collar and tie sash. Matching WHITE HAT/4129 and LAVENDER HAT/673 can be ordered in Lily and Taylor Hats. 2 piece french crepe suit. Straight skirt, collarless jacket with three jeweled buttons and ruffled sleeve trim. Jeweled brooch included. Matching WHITE HAT/671 and ICE BLUE HAT/244 can be ordered in Lily and Taylor Hats. 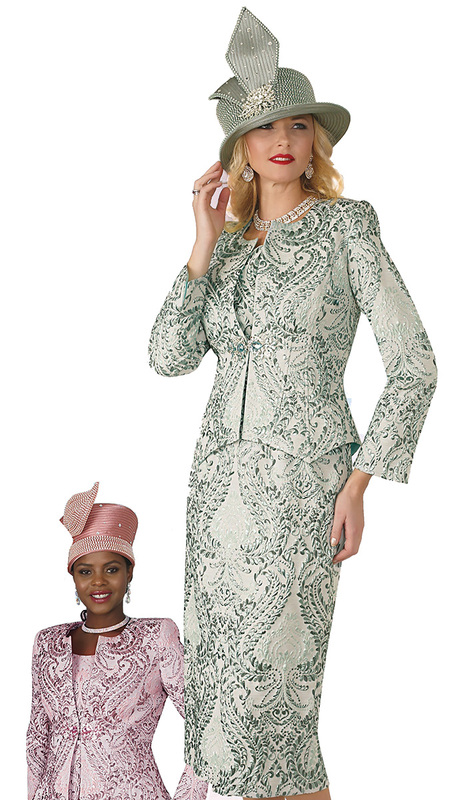 2 piece shimmery suit with floral brocade pattern and plume trim. Jeweled brooch included. Matching WHITE HAT/596 can be ordered in Lily and Taylor Hats. 1 piece silky lace dress with floral brocade pattern and flared sleeves. Jeweled brooch included. Matching WHITE HAT/558 can be ordered in Lily and Taylor Hats. 2 piece french crepe suit. Straight skirt. Top with asymmetrical hem, elbow length flared sleeves, jeweled clasp and brooch. Matching WHITE HAT/582 and ORANGE HAT/597 can be ordered in Lily and Taylor Hats. 1 piece dress with floral print, flared and slit sleeves with bow trim. Jeweled bow brooch included. 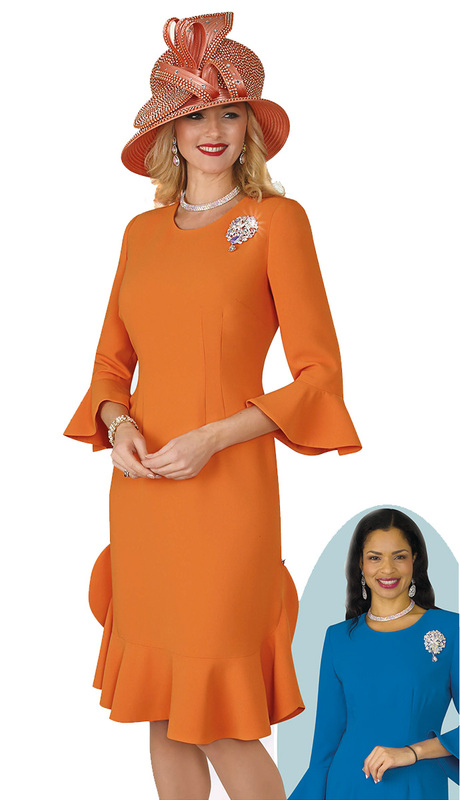 Matching ROYAL HAT/642 can be ordered in Lily and Taylor Hats. 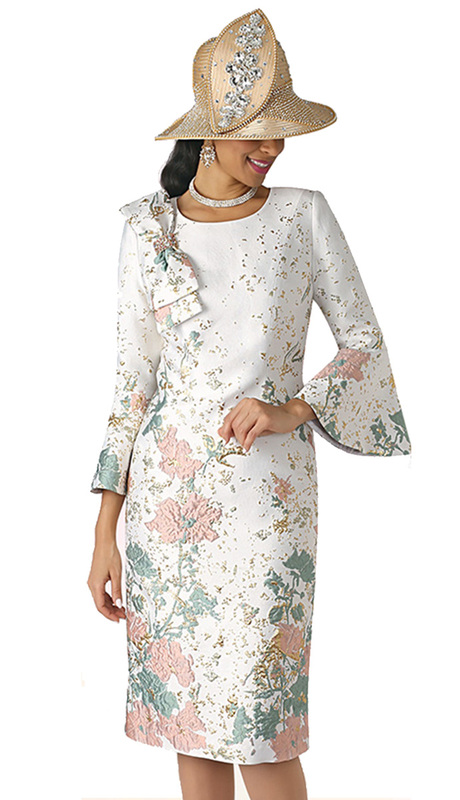 1 piece floral brocade dress with flared sleeves and bow trim. Jeweled brooch included. Matching MAUVE HAT/505 can be ordered in Lily and Taylor Hats. 3 piece french crepe suit. Straight skirt and cami. 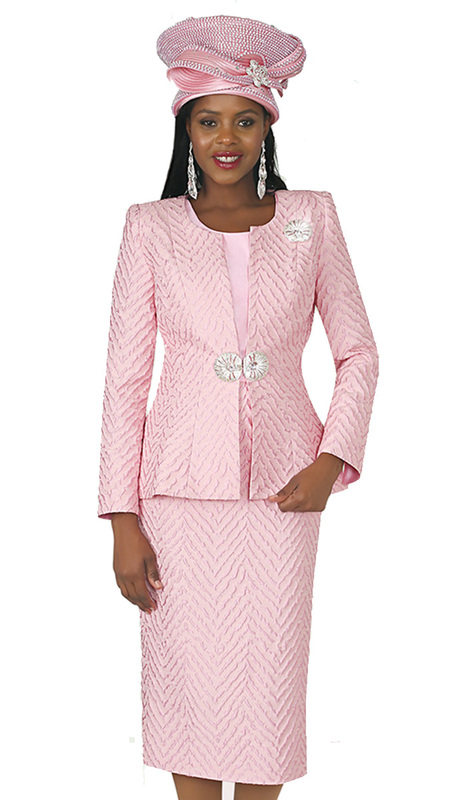 Collarless jacket with contrast beaded trim, jeweled clasp and brooch. Matching BLACK HAT/260 can be ordered in Lily and Taylor Hats. 2 piece french crepe suit. Straight skirt. Top with flared sleeves and bow tie contrast trim. Jeweled brooch included. Matching BLACK HAT/647 and PURPLE HAT/577 can be ordered in Lily and Taylor Hats. 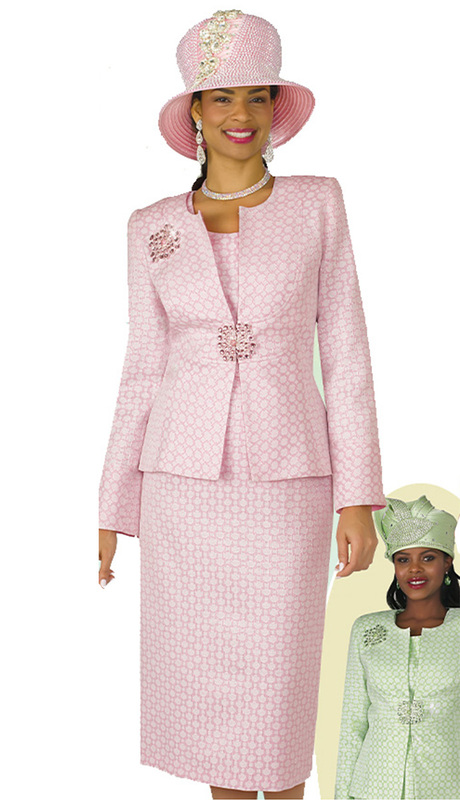 2 piece twill suit in daisy pattern. Straight skirt. Jacket with standing collar, peaked hem, slit cuffs and two deco buttons. Matching SKY BLUE HAT/351 and PEACH HAT/646 can be ordered in Lily and Taylor Hats. 1 piece silky floral print, shift dress with long sleeves and beaded neckline. Matching SILVER HAT/351 can be ordered in Lily and Taylor Hats. 3 piece silky twill suit. Straight skirt and cami. Notched lapel jacket with jeweled clasp and brooch. Matching RED HAT/579 and GOLD HAT/590 can be ordered in Lily and Taylor Hats. 3 piece silky twill suit. Cami and straight skirt. Jacket with standing collar, three jeweled buttons, slit cuff sleeves, and jeweled brooch. Matching APPLE GREEN HAT/349 can be ordered in Lily and Taylor Hats. 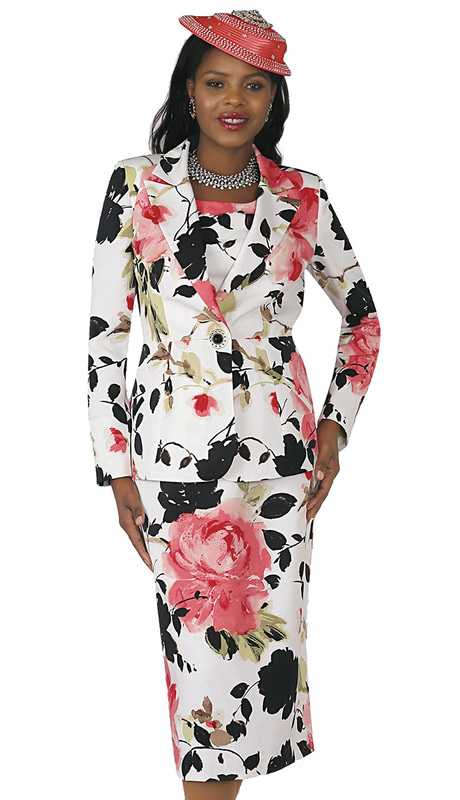 3 piece floral brocade suit. Straight skirt and cami. Collarless jacket with peaked hem. Matching ROSE HAT/505 and SAGE HAT/674 can be ordered in Lily and Taylor Hats. 2 piece ponte knit suit. Straight skirt. Top with dramatic ruffle flared sleeves featuring print lining. Jeweled brooch included. Matching NAVY HAT/365, BLACK HAT/577, NAVY HAT/643 can be ordered in Lily and Taylor Hats. 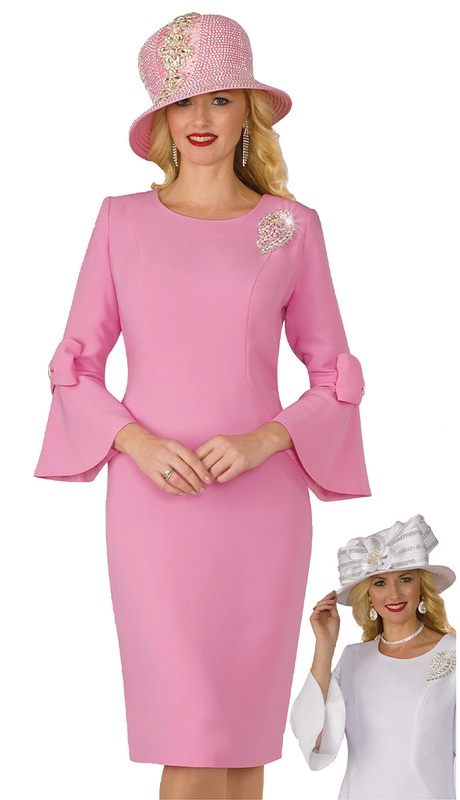 1 piece french crepe dress with flared sleeves, bow tie trim, and jeweled brooch. Matching WHITE HAT/267 and PINK HAT/568 can be ordered from Lily and Taylor Hats. 1 piece ponte knit dress with slit, flared sleeves featuring micro-jeweled trim, and jeweled neckline. Matching ROSE HAT/505 and WHITE HAT/554 can be ordered in Lily and Taylor Hats. 3 piece silky twill suit. Cami and straight skirt. Jacket with flared sleeves and slit cuffs. Jeweled button and brooch. Matching FUCHSIA HAT/668 can be ordered in Lily and Taylor Hats. 2 piece silky twill suit. Straight skirt. Two jeweled button jacket with floral embroidery trim. Matching FUCHSIA HAT/679 and YELLOW HAT/120 can be ordered in Lily and Taylor Hats. 2 piece silky twill suit. Straight skirt. Three jeweled button jacket with wide lapels. Matching CANARY HAT/641 can be ordered in Lily and Taylor Hats. 2 piece silky twill suit. Straight skirt. Wide lapel jacket with 3 jeweled buttons. Belted sleeves with jewel buckle and slit cuffs. Matching ICE BLUE HAT/244, PINK HAT/123, LAVENDER HAT/675 can be ordered in Lily and Taylor Hats. 1 piece french crepe dress with flared sleeves and micro-jeweled trim. Jeweled brooch included. Matching ROYAL HAT/121 and NAVY HAT/678 can be ordered in Lily and Taylor Hats. 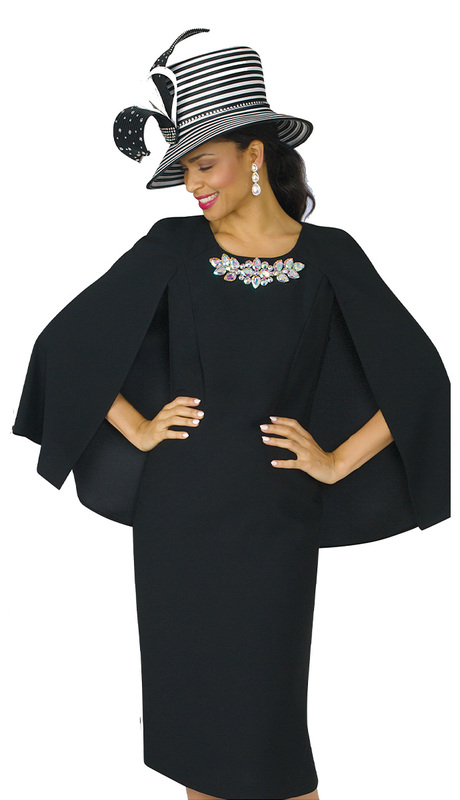 1 piece crepe dress with attached cape and jeweled neckline. Matching BLACK HAT/647 can be ordered in Lily and Taylor Hats. 1 piece ponte knit dress with micro-jeweled trim and jeweled brooch. Matching MAUVE HAT/568, IVORY HAT/255, NAVY HAT/256 can be ordered in Lily and Taylor Hats. 2 piece french crepe suit. Fit-and-flare skirt. Jacket with two jeweled buttons, large bow and jeweled neckline clasp. Matching LAVENDER HAT/673 and NAVY HAT/573 can be ordered in Lily and Taylor Hats. 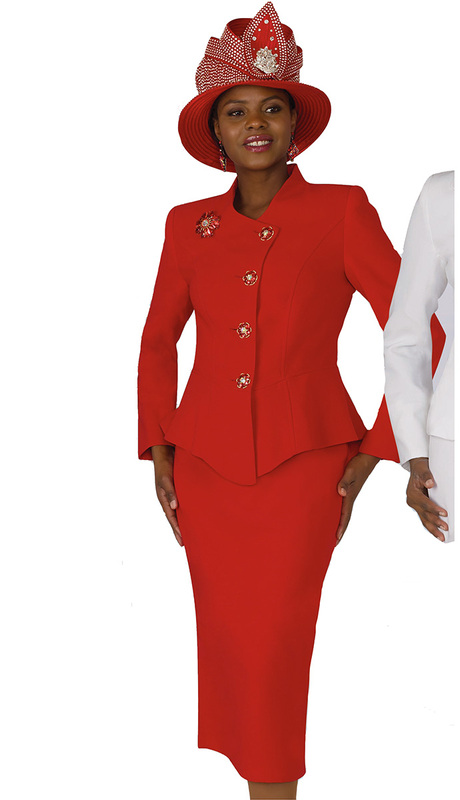 2 piece poly crepe, classic suit. 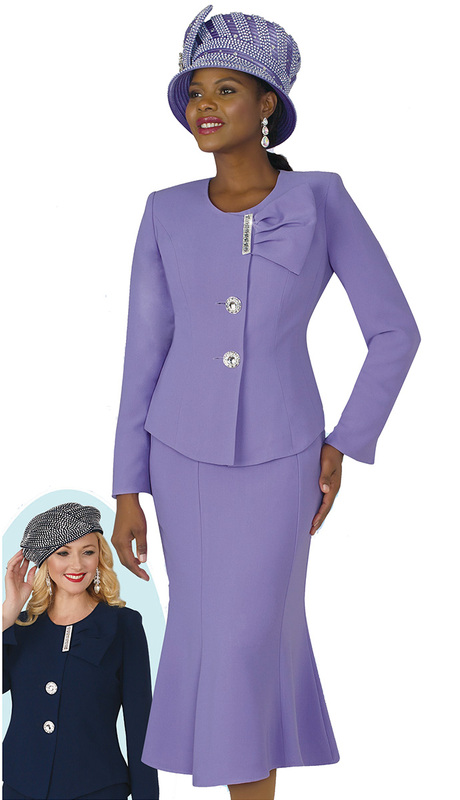 Straight skirt with three button, notched lapel jacket. Matching WHITE HAT/672 can be ordered in Lily and Taylor Hats. 2 piece poly crepe suit. Straight skirt with asymmetrical hem jacket, four jeweled buttons, and jeweled brooch. Matching RED HAT/578 can be ordered in Lily and Taylor Hats. 2 piece crepe suit. 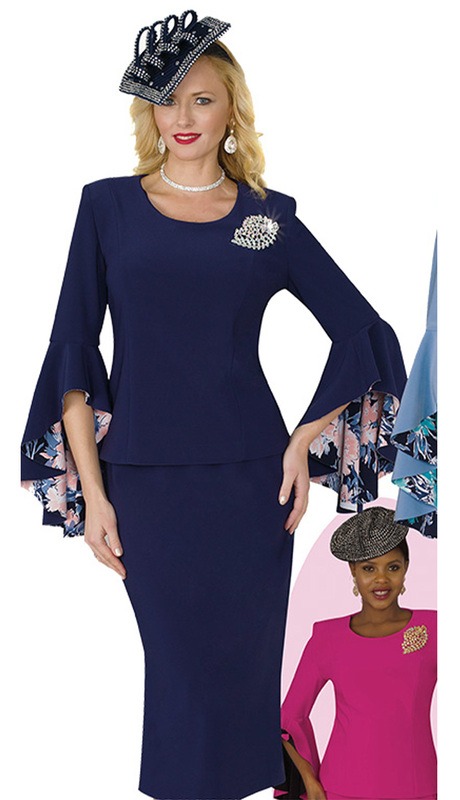 Straight skirt with flared sleeve top, large bow trim and jeweled bow brooch. Matching RED HAT/589 can be ordered in Lily and Taylor Hats. 3 piece silky twill suit. Straight skirt and cami. Standing notched collar with jeweled clasp and brooch. Matching ICE BLUE HAT/243 and WHITE HAT/243 can be ordered in Lily and Taylor Hats. 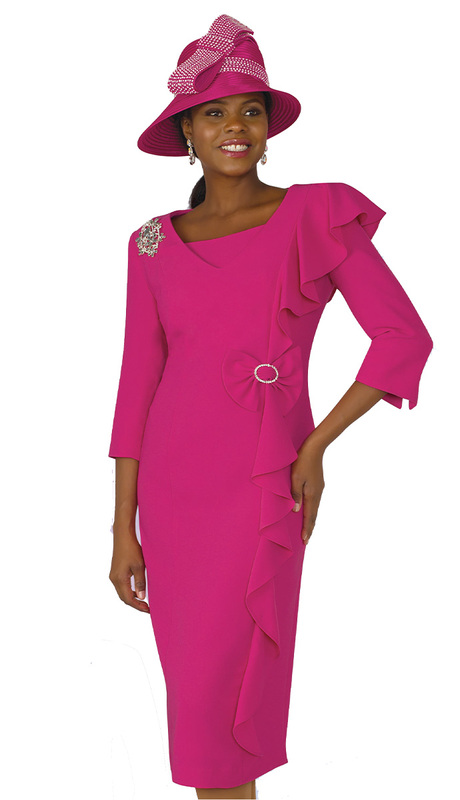 1 piece french crepe dress with full length ruffle trim, slit cuffs, and jeweled brooch. Matching FUCHSIA HAT/566 can be ordered in Lily and Taylor Hats. 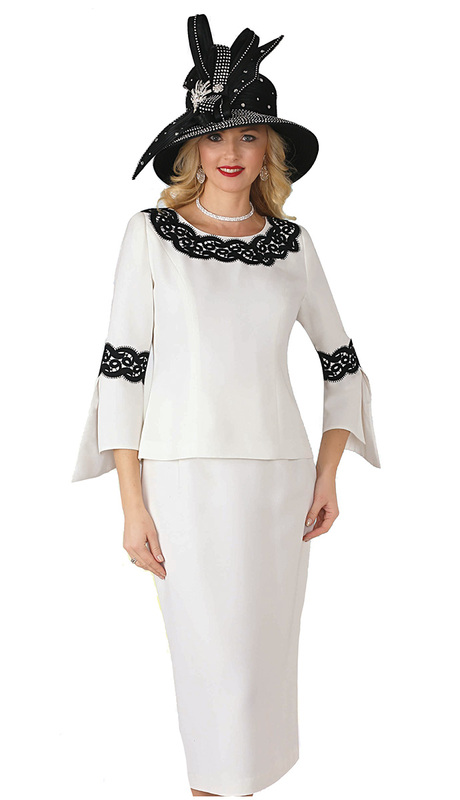 1 piece lace jacquard, fit-and-flare dress with silky floral shaped collar and cuffs. Jeweled brooch included. Matching BLUE HAT/351 can be ordered in Lily and Taylor Hats. 3 piece silky twill suit. Cami and straight skirt. Floral lace collarless jacket with jeweled neckline and trim. Matching BLACK HAT/260 can be ordered in Lily and Taylor Hats. 3 piece silky twill suit. Cami and straight skirt. Collarless jacket with jeweled neckline, clasp and trim. Matching SILVER HAT/590 can be ordered in Lily and Taylor Hats. 2 piece silky twill suit. Straight skirt and top with jeweled neckline and trim. Matching ORANGE HAT/247, WHITE HAT/247, GOLD HAT/555 can be ordered in Lily and Taylor Hats. 3 piece poly crepe, classic suit. Straight skirt and cami. Collarless jacket with jeweled clasp and brooch. Matching WHITE HAT/264 and ROYAL HAT/580 can be ordered in Lily and Taylor Hats. 2 piece poly crepe suit. Straight skirt with collarless, four button jacket. Matching PURPLE HAT/265 can be ordered in Lily and Taylor Hats. 2 piece poly crepe suit. Cami and fit-and-flare skirt. Shawl collar, two jeweled button jacket. Matching RED HAT/559 can be ordered in Lily and Taylor Hats. 1 piece knit dress with beaded floral pattern. Matching WHITE HAT/263 can be ordered in Lily and Taylor Hats. 3 piece knit suit. Cami and skirt with ruffle hem. Open, collarless jacket. Matching BLACK HAT/365 can be ordered in Lily and Taylor Hats. 3 piece knit suit. Straight skirt and cami. Open, collarless jacket with ribbon shoelace sleeves. 3 piece knit suit. Straight skirt and cami. Buttoned v-neck jacket with stitch trim. 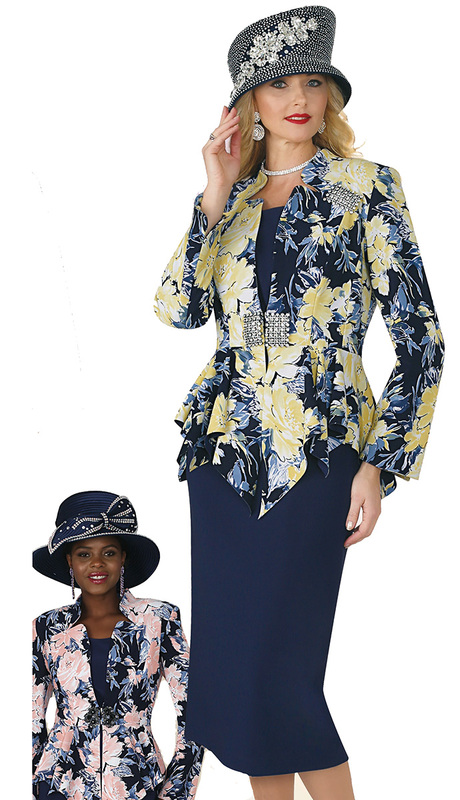 Matching IVORY HAT/596 and NAVY HAT/643 can be ordered in Lily and Taylor Hats. 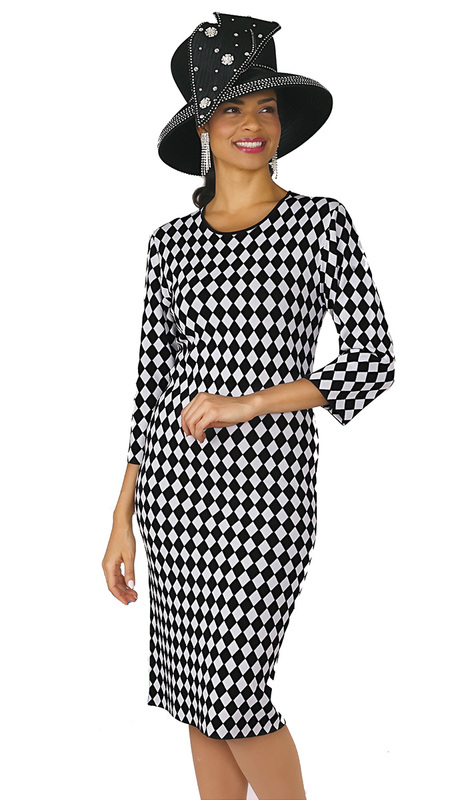 1 piece knit dress in a diamond check pattern. Matching BLACK HAT/648 can be ordered in Lily and Taylor Hats. 1 piece knit dress with jeweled neckline and elbow length sleeves. Matching YELLOW HAT/120 can be ordered in Lily and Taylor Hats. 2 piece knit dress with jeweled bead pattern and zip jacket. Matching ROYAL HAT/577 and BLACK HAT/648 can be ordered in Lily and Taylor Hats. 2 piece knit suit in abstract print with zipper jacket and straight skirt. Matching BLACK HAT/577 can be ordered in Lily and Taylor Hats. 1 piece knit dress with contrast stripe trim on flared sleeves, wrap top and jeweled belt. Matching BLACK HAT/577 and RED HAT/577 can be ordered in Lily and Taylor Hats. 1 piece fitted, knit dress with geometric vertical stripes and flared hem. Matching BLACK HAT/260 and GREEN HAT/577 can be ordered from Lily and Taylor Hats. 2pc. Silky Twill Skirt Suit with Novelty Button and Brooch. One piece embroidered lace dress. Two piece scuba dress and jacket. Three piece scuba skirt suit. 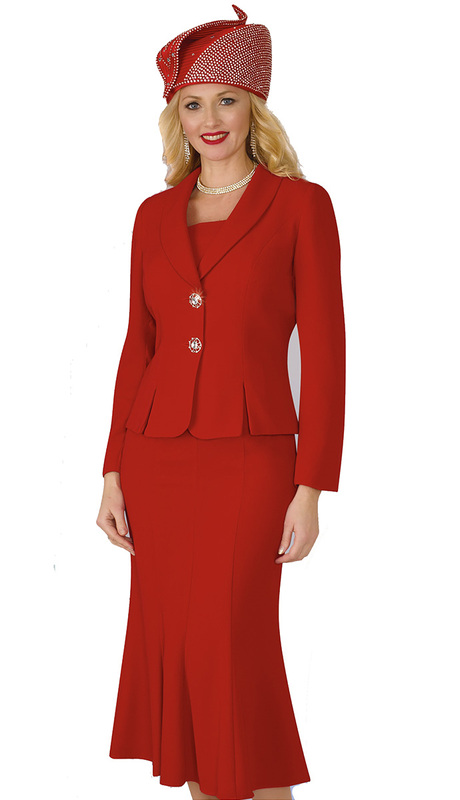 Three piece skirt suit with silky twill fabric. Two piece silky twill skirt suit with lace trim. Two piece crepe top with lace skirt suit. Two piece scuba skirt suit with rhinestones. Three piece scuba skirt suit with rhinestones. Three piece lace with scuba skirt suit. Three piece silky twill skirt suit. Three piece novelty skirt suit. Three piece novelty silky twill skirt suit. Two piece novelty skirt suit. 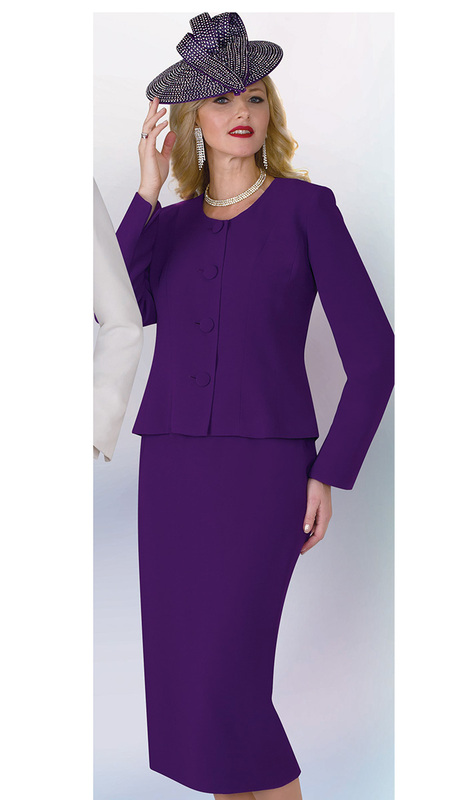 Three piece silky twill with novelty skirt suit. Two piece silky twill skirt suit. 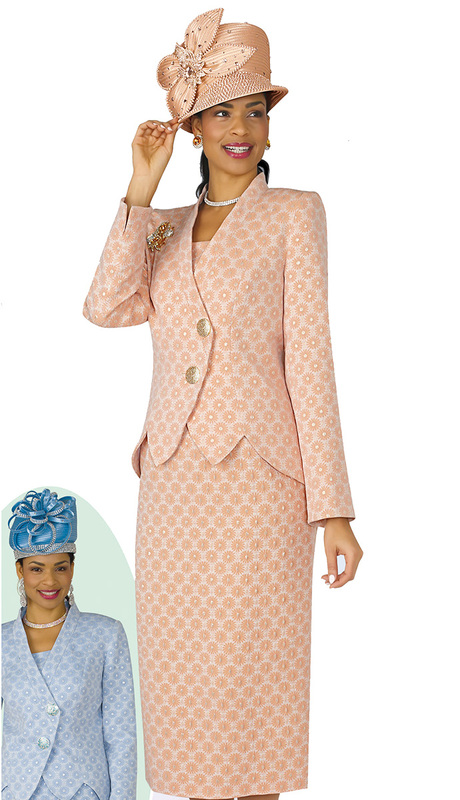 Three piece novelty skirt suit with beaded trim. Three piece silky twill with lace skirt suit. One piece french crepe dress with faux leather collar and cuffs. One piece french crepe dress with beaded necklace. One piece silky twill dress with embroidery trim. One piece french crepe dress with cape. One piece ponte knit cocktail dress with rhinestones. One piece ponte knit dress with beaded necklace. One piece ponte knit dress. One ponte knit ruffle dress. 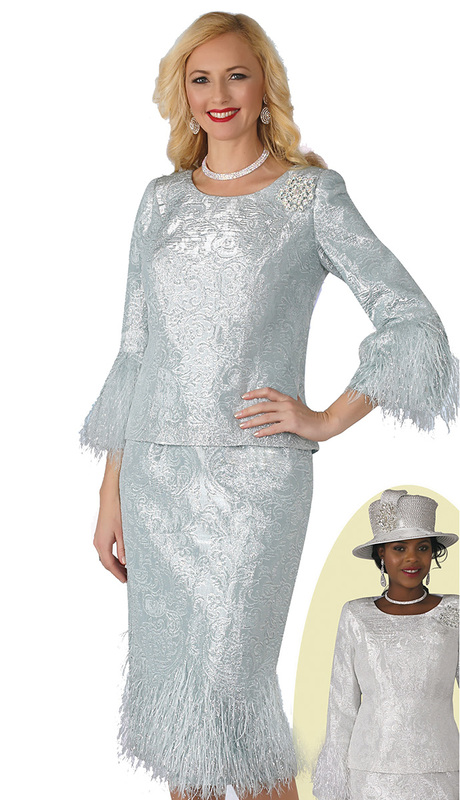 One piece novelty fabric church dress with texture effect.